Thomas Harold Cooper's entry in the Medal Roll of the Lincolnshire Regiment, WW1. 28th August, 1915 Grantham Journal report of Thomas Harold Cooper's injury at Gallipoli. Thomas Harold Cooper's brief obituary notice published by the Grantham Journal on the 2nd February, 1918. 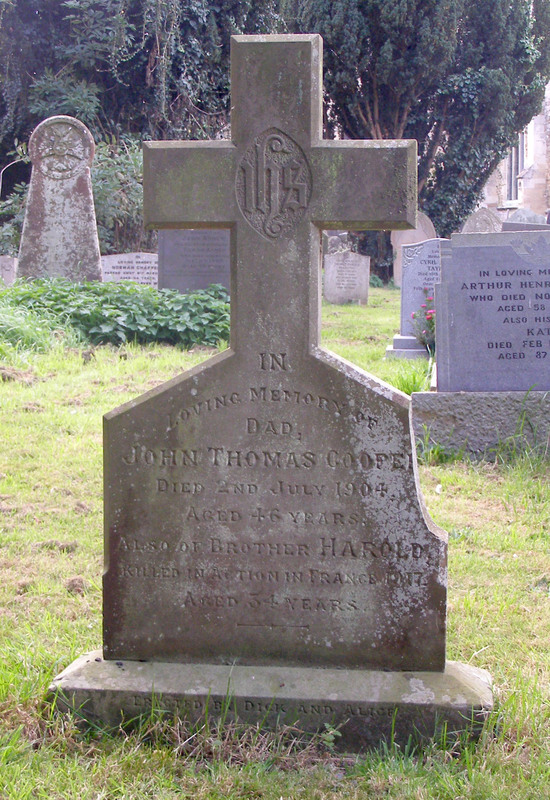 Grave stone of John Thomas Cooper and Harold Cooper, Bottesford. The inscription reads: "In Loving Memory of Dad, John Thomas Cooper, Died July 1904, Aged 46 Years. Also of Brother Harold, Killed in Action, France 1917, Aged 34 Years." 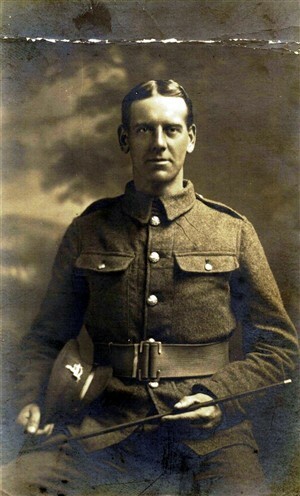 Said to have been the first Bottesford man to volunteer on the outbreak of war. The history of the family of John Thomas Cooper has been given in the excellent page posted by Don Roach, one of his descendants in Australia. The outline presented here summarises information obtained from the Census returns, with some augmentation from online searches. This is no more than a supplement to Don’s account, which is much to be recommended. In 1881, John Thomas Cooper, single, aged 25 (b.1856-58, London), lived at 20 Queen Street, the premises of his uncle, tailor Robert Edwards, aged 68. There were also two apprentices, and seems that John Thomas was ‘learning the trade’. In the second quarter of 1881, John Thomas Cooper married Mary Guy, registered at Grantham. This was only weeks after the 1881 census, which had recorded Mary Guy (23) as a housekeeper living with her grandfather, Andrew Guy (80), at 3 Albert Street, a household which also included another grand-daughter (Mary’s cousin) Sarah E Philcox (17), and a three years old ‘boarder’, Sarah Spalton. In 1891, John T Cooper, tailor, was at 5 Baker Street (probably Chapel Street), with wife Mary, and sons John Richard (9, b.1882), Thomas Harold (6, b.1885) and Rowland (2, b.1889). In 1901, the family had moved to 6 Queen Street, where we find John T Cooper, 43, tailor (b. Knightsbridge, 1858), with Mary, sons Harold (16), Rowland S (11), and two daughters, Edith Sarah (8) and Constance Elizabeth (4). John Richard Cooper had left home by this date, and was serving with the Army Ordnance Corps in South Africa. By the time of the Census of 1911, John Thomas Cooper had died, only forty six years old, in 1904, and been buried at Bottesford. His widow, Mary Cooper, now 53, lived at 4 Queen St, “on poor law relief”, with her daughter Constance Elizabeth, 14, working as a domestic servant. Her elder daughter, Edith Sarah Cooper (17), was sharing 10, Albert St with her friend Emily Riley, 20, both employed as dressmakers. Her sons, Harold and Rowland Cooper, 25 and 21 respectively, were employed as ‘groom, livery stable’, at the Red Lion Inn which was owned by Ernest Lamb. Their work may have been in relation to the stables built in the grounds of the Old Rectory, on the northern side of Church Street. Rowland Cooper emigrated to Australia in 1911: The passenger list can be seen online. He was recorded as a grocer’s assistant, and had Ticket 986 on the steamship “Otway”, of the Orient Line, which departed from London for Fremantle on15/9/1911. He died in 1949. Searches for his military records, if any exist, have not been successful. 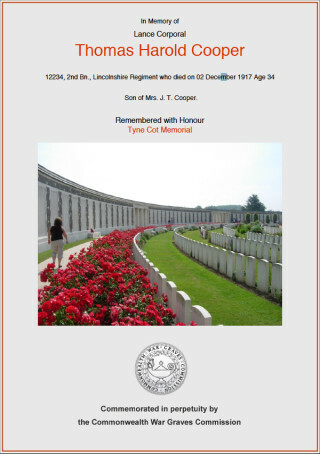 The Medal Roll of the Lincolnshire Regiment lists Thomas Harold Cooper as having served with three different Battalion’s of the Lincolnshire Regiment – the 6th, 1st and the 2nd. He lost his life on the 2nd December, 1917, serving with the 2nd Battalion, Lincolnshire Regiment. He was a Lance-Corporal. The short obituary note published on the 2nd February, 1918, records that he had been reported missing some two months previously, and that it had been concluded that he died of his wounds. He had been the first Bottesford man to volunteer on the outbreak of war, and had served in the Balkans and Gallipoli, before serving on the Western Front in France. However the record of UK Soldiers Killed in the Great War lists him as ‘killed in action’. The 3rd Battle of Ypres was officially terminated on the 20th November 1917. The Battle of Passchendaele was listed as the final engagement. However, one final action was carried out on the Passchendaele Ridge west of Ypres 12 days later in the early hours of the 2nd December 1917. It has been described as ‘(A) Moon light Massacre” (see M.S LoCicero (2011) ‘A Moonlight Massacre: The Night Operation on the Passchendaele Ridge, 2nd December 1917’ PhD University of Birmingham). The 2nd Battalion, Lincolnshire as part of that action took heavy losses. Sadly Thomas Harold Cooper was one of those killed having survived injury with the 6th and further service with 1st Battalion of the Lincolnshire Regiment. The Commanding Officer’s report of the action in the Battalion War Diary (National Archive War Diary Reference WO 95/1730/1_2) reveals that his men came under heavy shell on the way up to the front line on the afternoon of the 1st December. Only 20 men of C Company, the reserve battalion, made it to their front line position. The conditions were so arduous that it took over 4 hours for the remaining three companies to make it across the desolation of the battle field along treacherous duck boards to their attack position. The first company was in position by 10 p.m., and the last company finally arrived at 12:20 a.m.
Those companies attacked in bright moonlight at 1:55 a.m., on 2nd December 1917. They immediately came under heavy machine gun fire. The officers from all three companies were casualties. Without officers the men had been warned in training to dig in within 50 yards of the first enemy trench they came to, or as close as possible to the advancing barrage laid down to cover their advance. Still under enemy fire the surviving men stopped their advance and dug in about 30 yards from the enemy’s front line trench. It would be a long night and following day. A relief officer from the Reserve Company sent up to take command at 10.00 a.m., succumbed to sniper fire. Heavy shell fire persisted all day. Finally the 8th Rifle Brigade completed the relief of the 2nd Battalion the Lincolnshires. between 10.00 – 11.00 p.m., some 24 hours since the start of their doomed advance. We have not been able to trace which Company Thomas Harold Cooper was in. He could have been one of those killed or wounded in the Reserve Company in the initial enemy barrage or later as part of the attack. His body was never recovered and he is commemorated at Tyne Cot Memorial, Belgium. He was awarded the Allied Victory Medal and the 1915 Star. He is also commemorated in the inscription added to his father’s gravestone in Bottesford church yard and on the Bottesford War Memorial in St Mary’s Church (see Don Roach: John Thomas Cooper, his family and descendants).